North Korea: the most exclusive country in the world. 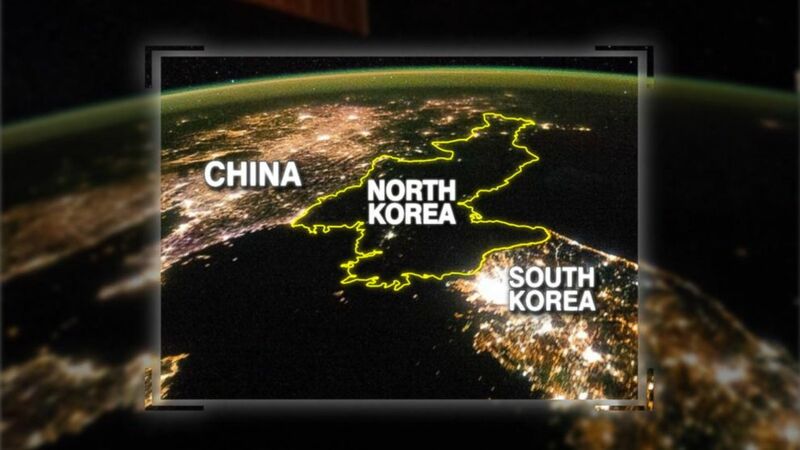 Recently at the heart of an unprecedented nuclear escalation with the United States, separated from South Korea since 1948, and backed by China since the end of the civil war, it is now surrounded by an iron curtain even taller than the Soviet Union. The majority of the country is in a state of heavy backwardness, and the population that had, in the 1990s, suffered one of the most terrible famine crises ever. And now, according to Telegraph, North Korean citizens are told to prepare for a new “Arduous March” (so was named that famine crisis). Does it make sense with these premises to talk about technological innovation? The answer to this question is not so obvious as it may sound. Living conditions in most of the country seem to be terribly backward, but North Korea has already developed nuclear bombs and is testing mobile ICBM. All this would lead to the conclusion that there is some technology in North Korea; a technology that is sophisticated, and according to neutral observers’ analysis, it is evolving at an extremely rapid pace. To date, there are not many technologies available to consumers, and most of them are still a very small elite of people (see below). However, also thanks to the black market, things are (very) slowly changing. Of course, even if technology remains unavailable to most of the citizens, we should refrain from considering North Korea as the third world. North Korea has its own “Internet”, known as Kwangmyong, based on dial-up connections to its telephone network. By 2014, the estimated number of phone lines in the country was estimated at just over one million, which may seem reasonable for a population of around 22 million. However, most of them are dedicated to the governmental elite, and to some hotels (where they are only for foreigners). And in fact, the number seems to have stopped since 2008. Kwangmyong has been registered with ICANN since 2007 with the .kp domain, and it has its own peculiarities: it is not possible to access it from the outside or provide access to the Internet from inside Kwangmyong. This makes it, in fact, more of a sort of national intranet than a real Internet. Access to Kwangmyong is only available from a few urban areas and major universities. Second-level domains are initially administered by KCC Europe from Berlin, but the management was later moved to North Korea and entrusted to Star JV, a joint venture between the Korean Post and Telecommunications Corporation (KPTC) and the Thai Loxley Pacific. Actually, it is incorrect to say that Kwangmyong is totally isolated from the Internet. Foreigners and universities do have access to the outside, albeit closely monitored. Kwangmyong’s connection to the Internet was initially obtained via Intelsat satellite. Subsequently, with the creation of the Joint Venture Star, it was decided to opt-in for fiber-optic connections1. 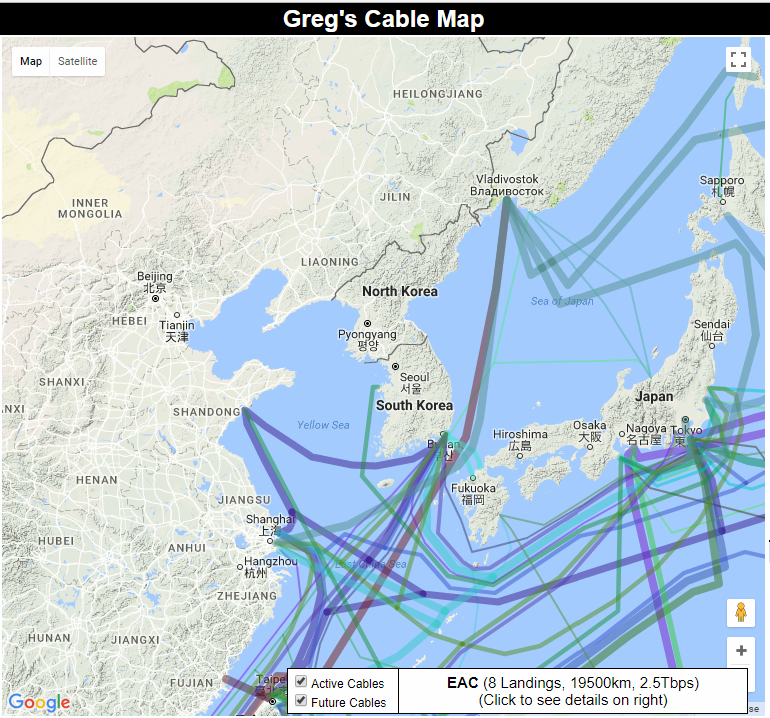 North Korea is one of the few countries having no connection with any of the major international submarine cabling systems. 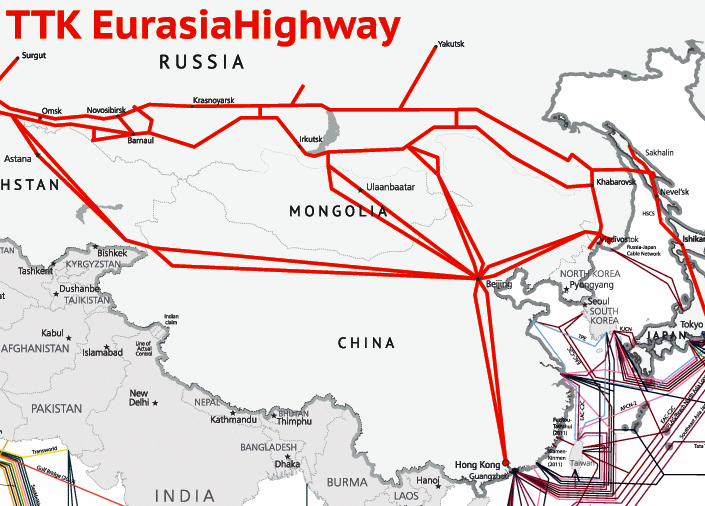 Just recently North Korea has closed a deal with TTK to have a second optical fiber connection to the Internet, between Vladivostok and Pyongyang, adding up to the one provided by China already in place. Having a backup external connection will help North Korea having a more robust connectivity than before. This might be the response to the DoS (Denial Of Service) attacks brought by the United States, as reported by the Washington Post on September 30th. All Kwangmyong traffic is closely monitored, and most of the content is not accessible from the outside. However, there are some major sites that are visible from the Internet. The Korean Central News Agency (KCNA) is the official press agency, which reports the view of the government and it is for foreigners’ use only. It is one of the pillars of state propaganda. Here it is possible to find stories in Korean, English, Spanish, and Japanese. 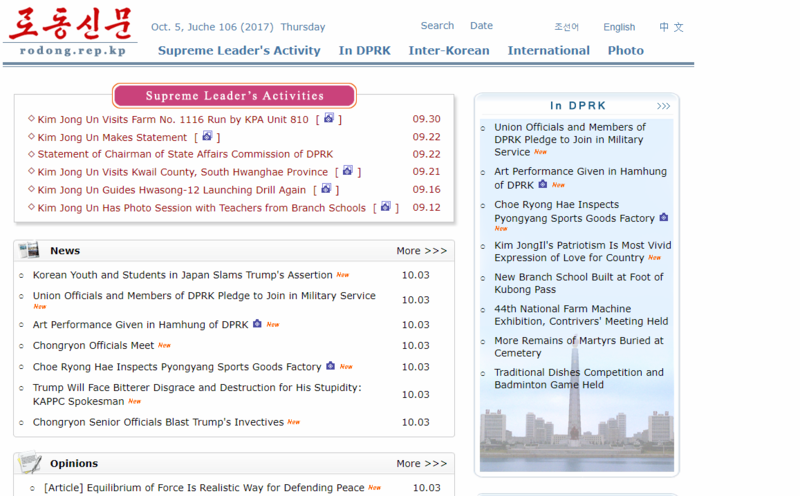 Naenara (“my country” in Korean) is the official state portal that contains declarations and activities of the government, as well as an extensive news section focused around the major printed periodicals such as The Pyongyang Times, DPR Korea, Korea Today and Foreign Trade. 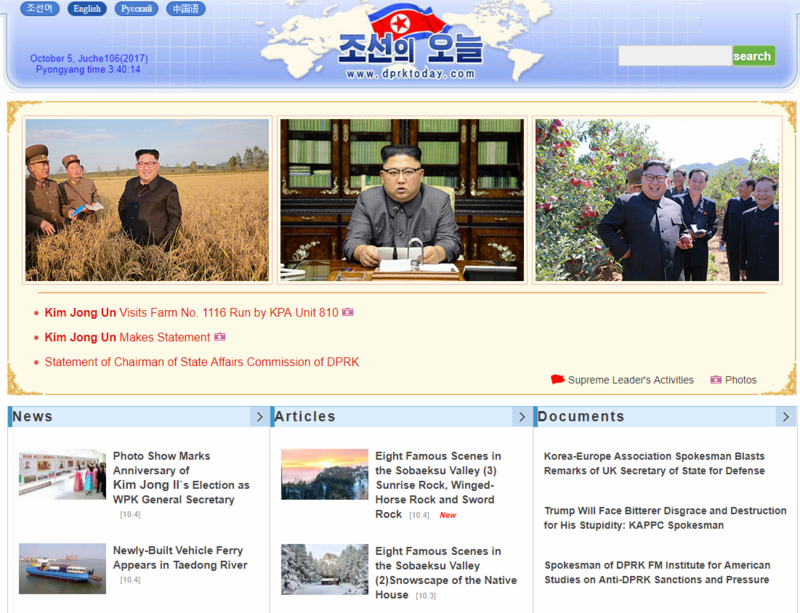 Rodong Sinmun is the website of the most important daily newspaper in North Korea, and it is published by the Central Committee of the Worker’s Party of Korea. It is often quoted by KCNA as the official source of government positions. DPRK Today is a Chinese site sponsored by the North Korean government. A site that was particularly watched abroad due to news not visible elsewhere, became famous last year because it curiously published an article in which she supported Trump’s candidacy for the US presidency. Another important site, in his own way, is Uriminzokkiri: a Chinese site, in addition to reporting news from official sources, also produces its content2. Its propaganda can sometimes be so pushed that it becomes bizarre. The site also keeps accounts on various social media, including a channel on Youtube. Here is a curious video that triumphantly announces the… victory at European championships (with a final 8-0 victory over Portugal)! Moreover, here you can find a list of the country’s leading official sites, broken down into thematic areas. The North Korea Tech is a fairly popular blog maintained by Martyn Williams who deals mainly with technology. 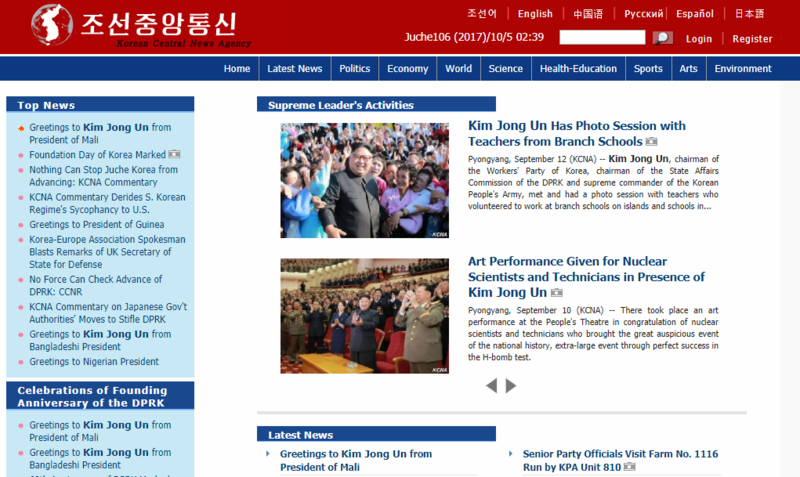 NK News is a Seoul-based site that follows North Korea’s events very closely. although it requires a subscription, it offers a limited monthly number of issues for free. 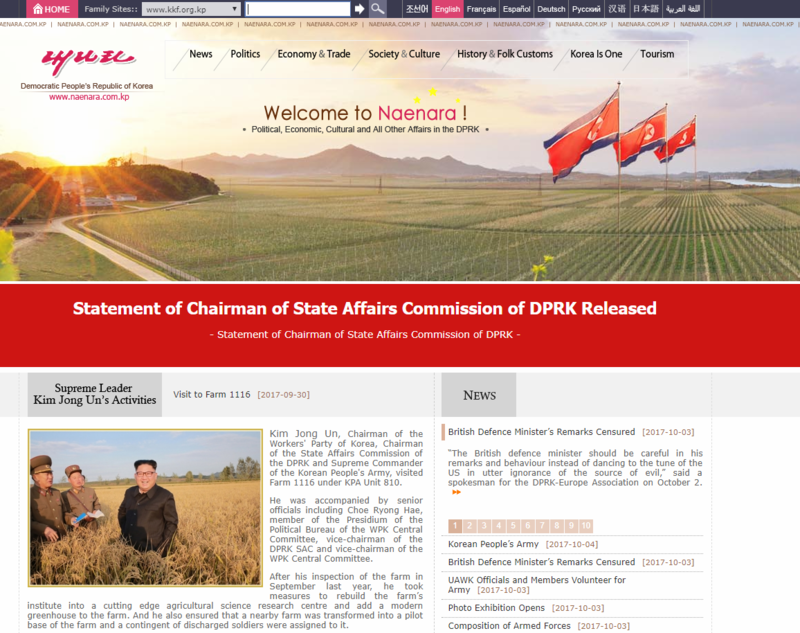 38 North is one of the most authoritative websites specialized on North Korea. It is an American project, which seeks to gather experts from all over the world to provide an international perspective. The diffusion of wireless networks in North Korea is troubled like the rest of the country. 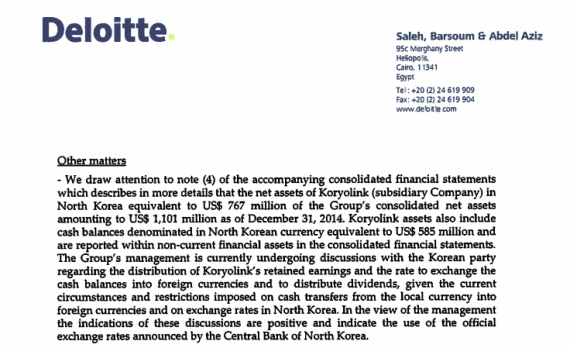 In 2008, the Egyptian company Orascom (since 2011 acquired for 57% by Global Telecom) and KPTC (telecommunications government), created Cheo Technology JV, a joint venture with Orascom with 75%, known as Koryolink, the first (and still the only) mobile operator in North Korea. In 2008, before this initiative, there were about one million phone lines in North Korea, though most of them were reserved for army officers. Mobile telephony had been introduced in the country already in 2002, but in May 2004 all the phones had been banned as consequence of the alleged assassination attempt of Kim Jong Il. When Orascom announces its intention to bring 3G connectivity to North Korea, they are greeted with skepticism because of the bad reputation of the government, but the project is successful and the number of subscribers already exceeded two million in 2014. 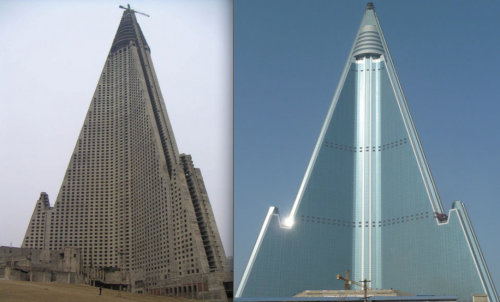 The business of 3G connectivity in North Korea is definitely risky in a country that at this time seems to be “forgotten by technology”.But Naguib Sawiris, known for being inclined to take risks, is not scared, so he commits to completing the construction of the Ryugyong Hotel, a 300 mt. tall concrete “ghost” in Pyongyang city center, which had been unfinished for years. The palace gets finished, the network is extended, and within few years the business starts generating profits, exceeding $700 million. The problems will start just as soon as Orascom tries to pocket those profits taking them to Egypt. The government, in fact, starts making troubles toward the export of the capitals, curiously asking Orascom to do so at the black market exchange rate, which would cut profits from $ 760 million down to 8. The problem is that the capital is not valued in dollars but in won, which is a currency not traded on the international market3. The government cannot to pay Orascom at the official rate, but it cannot officially acknowledge the black market rate either. Furthermore, in July 2015, the government announces the launch of a new mobile operator. This new operator will be run by Byol, in competition with Koryolink. As a last resort, Orascom tries to discuss a merger between the two entities, but to no avail. If that wasn’t enough, the government wants the majority of the new entity. Because of all these difficulties, Orascom decides to deconsolidate Koryolink and admits that “from a management point of view” Orascom has in fact lost control of its subsidiary. 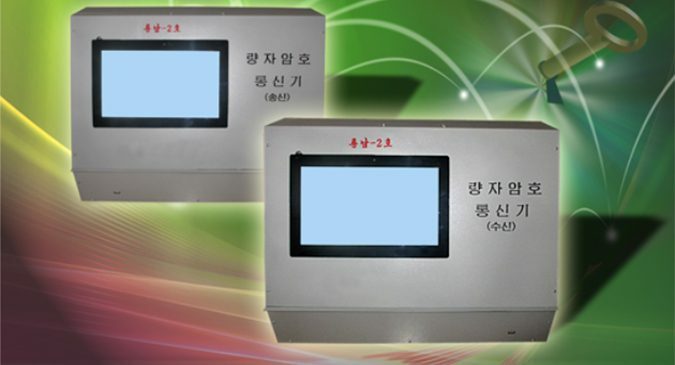 Koryolink is relatively more complex to handle since it is meant to be used both by North Koreans and foreigners. The reason is that it had to be designed to allow locals to only access the local domestic network (no internet), while at the same time foreigners are only allowed to access the internet4. As a curiosity, just to get an idea of the North Korean phone service, below I linked a website of a Koryolink simulator. Byol5 should be open only to the local population, making it easier to isolate any internet access. North Koreans are not permitted to make calls or to connect to abroad in any way. Those who succeed in obtaining smuggling Chinese smartphones can take advantage of them to connect to the Chinese network. That way they manage to call family members from areas close to the border. However, the penalty for those who are surprised with foreign phones is extremely severe. North Korea is a contradictory country, and the snapshot of the technological market today is no exception. 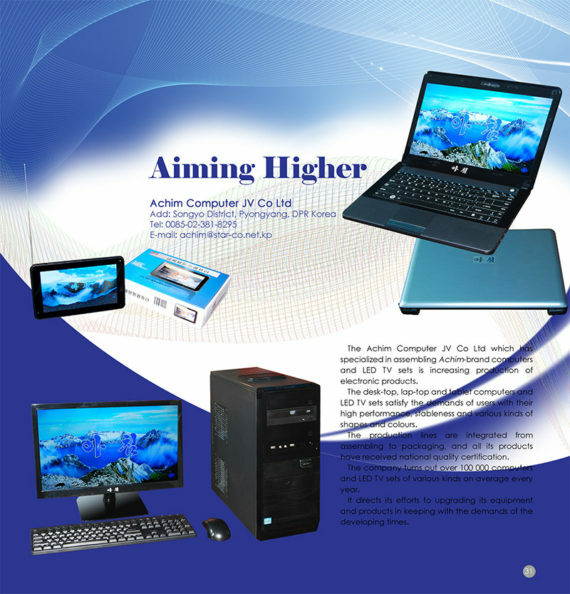 Although large sections of the population are in a state of destitution, the import and production of consumer electronics seems to be somewhat growing, and Pyongyang is also home to a trade show twice a year: in spring and fall, where it can also be found technology products more than reasonable despite the tightening of sanctions. For example, Ullim, the latest tablet released in 2016 (running with a custom version of Android 4.4.2), according to Daily NK met tremendous success, with the demand far exceeding the offer. 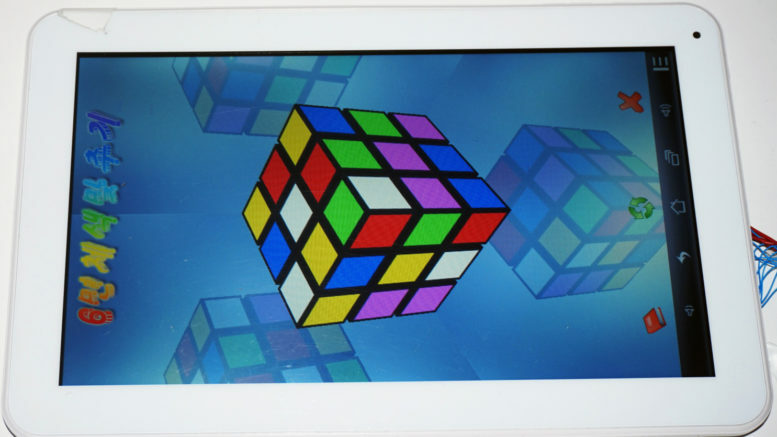 The tablet has the features to connect to the network, even lacking integrated Wi-Fi, but it has a series of features that make it almost impenetrable, in perfect accordance with the regime. Some German researchers from ERNW, after a few months of careful investigation, reported their findings at the Chaos Communication Congress in Hamburg. Implemented on the tablet there is a censorship on the apps that people can use, and a digital signature system. The signature is there to allow users to open only files created on the tablet itself, or by the government. The “Surveillance” system also includes watermarks the files with timestamp and registry information each time they are opened. This allows “authorized users” to access all the history (who has seen that file, when etc). The most disturbing feature is the one called “red flag“, which takes a snapshot of the entire system6 every time an app is opened, prevents manual erasure of any file and allows to export all the tracing data for later analysis. In addition, there is a trace viewer that allows the standard user to browse the tracing data on the tablet7. Reasonably recent desktop and laptop computers are not unknown in the DPRK. Typical of communist countries, almost all companies are either wholly state or joint ventures between state and foreign companies. However, the production is there, despite the increase in international sanctions has greatly aggravated the situation. There is also a DPRK operating system called Red Star, which is basically a modified Linux with a Mac OSX-like interface (see below), and of course, like Ulim, it is also locked down. According to Will Scott (see the video), Red Star is not much used in academia8, but rather in the industry. Curiously it is possible to download it via torrent from the internet. 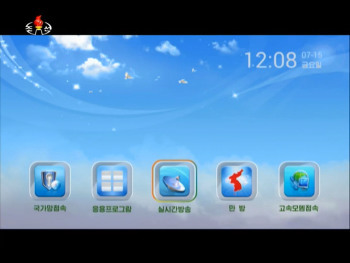 Even more surprising is the introduction of digital TV via IPTV in DPRK last year. The 4-channel streaming service is accessed via a set-up system called Marabang. According to KCTV (Korean Central TeleVision), the streaming is provided through Kwangmyong at around 37 Mb/s, which is a very high speed. If there is an area where the concern is increasingly shared about North Korea’s capabilities, that is computer security. The Sony Hack: North Korean responsibilities? On November 24th, 2014, a red skull appears on employees’ computer screens at Sony, making the systems inaccessible. The hacker claims to belong to a not better-specified #GOP (Guardians Of Peace) group. Speculations proliferate, many experts confirm that North Korea would be behind this attack, but the FBI declares “No attribution to North Korea at this point“. 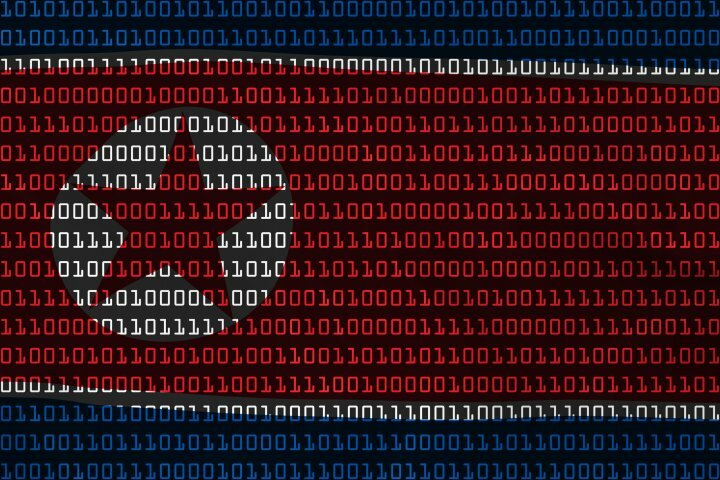 Today, after three years, there is still no evidence of DPRK’s responsibility in the attack on Sony, but this time it is accused of being behind the diffusion of the Wannacry malware said to be “cause of one of the widest computer-related infections ever”. According to some refugees, North Korea would be recruiting and training cyberwarriors from primary schools, and the brightest kids become part of an elite with privileges that are hardly imaginable by other Koreans. In addition, according to Martyn Williams, the DPRK would be working on quantum encryption, which would make (if realized) its own communications virtually unattackable. The main reason of this race might be related to missile development issues. In fact, radio communications, which are used to control the missile launches, are particularly susceptible to eavesdropping. For example, in the past the New York Times reported that some failure was to be attributed to American cyber-attacks. Screenshot of distribution and reception of quantum keys (photo: Naenara). The development of these technologies is, of course, cheaper and more accessible than the military apparatus, and China’s recent ban on coal imports from North Korea following severe UN sanctions could exacerbate this trend, bringing the government to focus even more on this “war” mode. 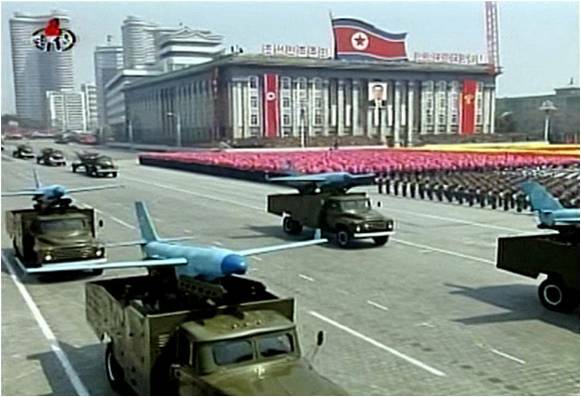 Another point of concern is the use of drones, especially since when they started to show in military parades. In fact, North Korea is making them flying over the DMZ and beyond the border with South Korea. Furthermore, according to PRI (Public Radio International), North Korea is working on a series of defensive drones capable of “capturing” the enemy drones and salvage them. The digital landscape in North Korea is of censorship and restriction, isolation … but also innovation. North Korea is a country possibly even more complex to understand than what the USSR was in its time. There is no other country that has succeeded in creating its own technological infrastructure from scratch, remaining isolated or almost from the rest of the planet, with increasingly severe international sanctions. But even if it is a curious thing to observe, it is worth pointing out that this technology is not designed to improve the North Koreans’ quality of life, but rather to control them. It is the antithesis of technology as we know it, and maybe it’s fascinating for it. 2. Mainly violent attacks in the US, Japan, and South Korea. 3. The official exchange rate states 100 won for $1, which is artificially high. The black market exchanges the won for much less, at a rate of over 8200:1. 4. Access to foreigners is, however, particularly expensive. Will Scott, an American academic who taught Computer Science in Pyongyang, reported of $80 for just voice subscription, $120 for data, plus $12 monthly for 50 Mb of traffic. 5. Which curiously translates as”star” in English, the same name as the joint venture on cable. 7. Presumably to remind him that everything he does is monitored. 8. According to his experience, students in academia seem to prefer Windows.